My brother introduced me to “Guitar Hero” over the summer. I couldn’t really get into it at the time. There were basically two reasons for this. First of all, I just wasn’t in the mood for that type of game on the day he brought it over. However, the concept stayed with me and whenever I hear rock songs, I imagine how easy or hard they would be to play in “Guitar Hero”. The other reason I didn’t get into the game when Dan brought it over is that I didn’t know any of the songs, but one or two. It’s really hard to get into playing the guitar for a song you’re not really into. Enter Frets on Fire. 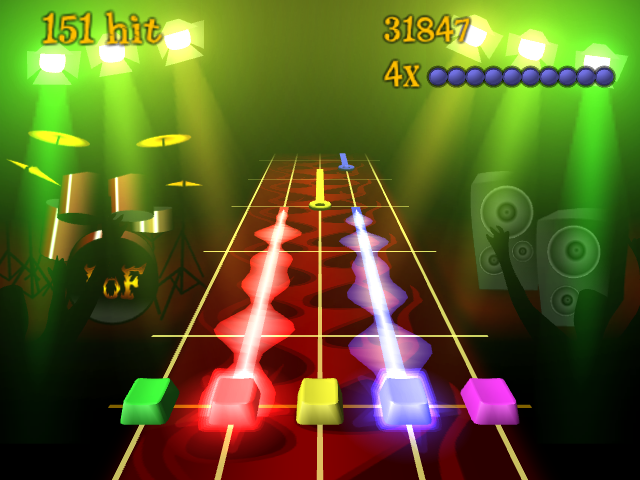 Frets on Fire is an open source version of “Guitar Hero” that plays on Linux, BSD, Mac, and Windows. The primary mode of play is to use your keyboard as the guitar. The F1-F5 keys are the frets and the enter key is the strum. Alternatively, I’ve heard that an Xbox guitar will work as it goes through the USB interface. I haven’t tried this myself, so I can’t comment. As you can see, the GUI is roughly the same as the commercial version. And Frets on Fire succeeds where the commercial game fails in that you can play along to ANY song you want! All you need to do is create an OGG of the song and then tell the game when the Frets should be hit. I imagine this is a lot harder than it sounds. I didn’t get to try it out. However, there are a ton of groups out there on the internet creating songs for Frets. I definitely want to try it with some Linkin Park, LostProphets, and Anberlin songs. I only had the change to play one song and part of the tutorial. The reason I didn’t finish the tutorial is the same reason that I only did so-so on the song I played – it’s really easy to misplace your fingers. In “Guitar Hero” I kept forgetting which finger was which color. I’m past that now, but I have a hard time making sure my fingers hit the right F-keys. I kept hitting escape accidentally and there’s only so many times I can listen to the same dialog, no matter how clever it is. So, to wrap up, although I didn’t like “Guitar Hero” the first time around, it seems that it’s not the entire genre that I dislike. Rather, it’s just that I didn’t like the selection of songs and I wasn’t ready for it. If it turns out that I really like frets, then I’ll probably pick up a USB guitar controller. HEY RIAA, all you needed to do was offer DRM-free music!